Innsbruck and Kitzbuhel, two venerable Austrian ski resorts, inspire images of European sophistication and elegance. ​It was from these mountain valleys that the first Austrians imported downhill skiing from Norway and later ventured to the US and Canada in the late 1930s. Austrians like Hannes Schneider founded New Hampshire's Mt. Cranmore and established a standard of ski instruction which nursed skiers from the venerable snowplow to the quick-turning `wedel' -- which dominated US skiing until the 1970s. The fall of the dollar has reduced the number of Americans who used to flock to these resorts for the combination famed skiing, cuisine, and ambiance impossible to find on the American continent. That is a shame, because an informal survey of Americans enjoying the expansive slopes in the shadows of the towering Kalkkogel and Kizbuheler Horn during a January visit found that these places offer comparable value to a ski vacation out West -- with the added experience of Europe as part of the bargain. Munich is the nearest European gateway to Innsbruck and Kitzbuhel, a 100 mile, two hour drive away by shared minibus. A more convenient .. and expensive option is to fly from Frankfurt directly to Innsbruck. Most package tours run from Saturday to Saturday. Unfortunately Saturday is also the day when throngs of fast-driving Germans also head for Austria's slopes, creating traffic lines at the border as long as one and half hours. Luckily the driver of our shared taxi knew the back routes across the an isolated border post to Innsbruck, a beautiful three hour drive. Innsbruck is known to Americans for its famed skiing, but with a population of more than 100,000 it is also Austria's second largest city. Visitors dressed for skiing feel a bit out of place stepping onto city streets filled with the bustle of city dwellers shopping or on their way to work. An efficient ski bus system [free], supplemented by regular and more frequent municipal busses, picks up skiers at central points throughout the city for the trip to the numerous nearby ski slopes. Before deciding on a ski destination, it is advised to check with knowledgeable staff at one of the many ski shops lining Innsbruck's main Maria Theresien Strasse. Axamer Lizum is one such area, a 40 minute ride by shuttle bus through picturesque countryside. The snow on the day of our visit was typical Eastern fare --no wonder the Austrians like New Hampshire so much! !-- well-groomed hardpack with some ice. But the ambiance -- broad, open slopes -- almost all skiing is above tree line -- against a sun-filled panorama of majestic peaks -- was spectacular. A combination of cable cars, quad and double chairs, and, as one goes higher, T-bars, provide access to the slopes. Each slope is numbered and color coded -- blue for beginner, red for intermediate, and black for expert. Be advised however that Europeans expect more of their intermediates than US resorts, and that some beginner slopes could prove intimidating to new skiers. Joining a ski school class on the first morning might be a good idea. 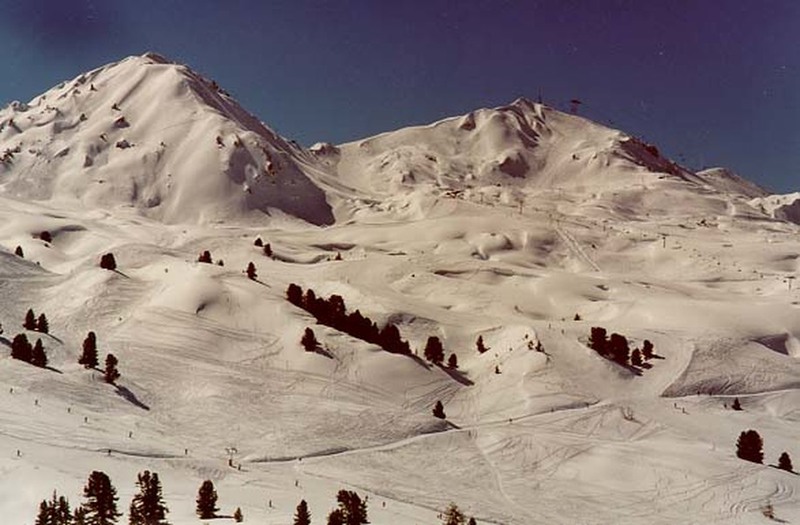 Beginner and Intermediate skiers will find plenty of challenging runs at Axamer Lizum. "Sipping hot chocolate against a crisp blue mountain panorama"
Next to skiing, Austrians take great pride in their sauna tradition. While many of the more expensive hotels have their own facilities, a true sauna is best experienced at one of the immaculate community sports facilities which exist in most towns and villages. There is nothing better than a three hour regimen of saunas, cold water plunges and relaxation after a day's hard skiing.Innsbruck's community sauna is on Amraser Strasse, around the corner from the train station. Entry to the swimming pool and sauna facilities -- usually shared by men and women --costs $10. Massages can be arranged for $20-40. ﻿Most of the skiing around Innsbruck is at relatively low elevations -- the highest elevation at Axamer Lizum is less than 7000 feet for example. Less than an hour's ride [by free skibus] from Innsbruck however, at the end of a narrow, winding valley lies the jewel is Innsbruck's skiing crown. At $40 for a day's skiing, the Stubai Glacier offers good skiers the possibility of powder ski heaven. The sun was shining the day we skied the glacier, which alone would have made for a spectacular day among the mountain peaks. almost one foot of dry, light powder had fallen the night before. But we enjoyed the added bonus of skiing untracked snow 'off piste' covering wide expanses of the gently sloping glacier all day. The glacier also offers fine intermediate and beginner skiing, as well as a ski school. The road to the glacier is marked with small villages, many of which boast a ski area rising from the edge of town. Towns like Neustift, or Axams are a good alternative for families watching their budgets who want to stay close to lifts and benefit from lower lodging prices available outside of Innsbruck. Kitzbuhel has the image of an expensive resort, with European gentry walking their St. Bernard's past the little Louis Vitton shop in the old city. But with a little care, travellers on a budget can enjoy riding the famed Hahnenkamm tram and skiing its Olympic downhill run and the Kitzbuheler Horn. Unlike Innsbruck, an hour's train ride distant, Kiztbuhel is a small town, one of many hugging the railway line snaking through this scenic Tyrolean valley. The Hahnenkamm and Kiztbulher lifts are a short walk from the town center. Like Innsbruck it might be best to spend some time in ski school or with a guide in order to locate the best combination of terrain, snow, and sunshine. The aptly-named 'Ski Safari' however, is an alpine experience to avoid. Too much time is spent riding lifts and there are to many skiers on a too narrow and uninteresting trails. The Ski Safari experience was redeemed however by passage through the runs at Wurzhohe near the village of Jochberg, a few miles from Kitzbuhel. Here we found the best skiing of the day -- open "cruising runs," uncrowded and with sufficient groomed snow. Once again, locating to a small pension or hotel near the base of this area, a ten minute ride [via free skibus] from Kitzbuhel, is a worthwhile option to explore. Another favorite spot is the Kitzbuheler Horn, a network of open beginner and intermediate runs favored by sun seekers, and a popular destination for legions of four and five year old schussers in ski school! It goes without saying that a key element of the Alpine ski day is lunch at one of the numerous 'huttes' serving food and drink throughout the mountain. Begin with a glass 'gluvine' - hot spiced wine. The lightest fare on offer is usually spaghetti bolognaise. The vener schnitzel is also not to be missed. Beer and huge plates of wurst are also to be seen in great quantity. ​North American resorts have never captured the unique ambiance where lunch is not a meal but an experience as important as the best skiing of the day. Spend an afternoon sipping hot chocolate against a crisp blue mountain panorama at the Alphenhaus, a small redoubt and you will understand why a visit to Tyrol in winter should not be missed. For more information on traveling with your family to Austria, see the contact form and directions on getting there below! Accommodations in Innsbruck w/breakfast at the elegant Hotel Europa Tyrol or one of the many smaller hotels. Guest house accommodations in nearby Neustift near the Stubai Glacier begin at less than $20 p/p. Accommodations in Kitzbuhel -- 7 nights in a small hotel/pension, w/breakfast and 6 days ski pass (rates vary). For 5 days all day ski school, check for additional rates that apply. Four star Hotel Tiefenbrunner offers similar package including dinner, sauna, solarium, and pool.